The bye week did McNary good. In their first game in seven days, the Lady Celts (13-4, 7-2) dominated North Salem 67-34 on Tuesday, Jan. 23. Eight different players scored, including four in double figures. Senior Kailey Doutt led the Lady Celts with 19 points, four rebounds and four steals in three quarters. McNary shot 47 percent from the field. Paige Downer went 4-for-4 from 3 to finish with 12 points. Sabella Alfaro added 10 points and six rebounds. Mackenzie Proctor provided 10 points off the bench. The Lady Celts were a perfect 13-for-13 from the free throw line. “We’ve been working on the amount of times we get to the line and increasing our free throw percentage, so that was good to see,” Doran said. McNary led from start to finish as Downer made her first 3-pointer less than a minute into the game. The Lady Celts led 16-9 at the end of the first quarter and 33-15 at halftime. Leading 49-19, Alfaro and four freshmen started the fourth quarter. With four points by Alfaro, six from Proctor, four by Kennedy Buss and two each from Leah Doutt and Annie-Leigh Besa, the Lady Celts outscored North Salem in the period 18-15. Two players, Dana Romero and Aaliyah Fitzke scored all of North Salem’s points. Romero led all scorers with 24 points and Fitzke added 10. McNary’s boys (13-4, 8-1) also won big on Tuesday, defeating the Vikings 85-51. The Celtics led just 35-29 at intermission before outscoring North Salem 50-22 in the second half. Chandler Cavell finished with 18 points and six rebounds. Andrew Jones had 12 points. Boston Smith added 11 points and six rebounds. 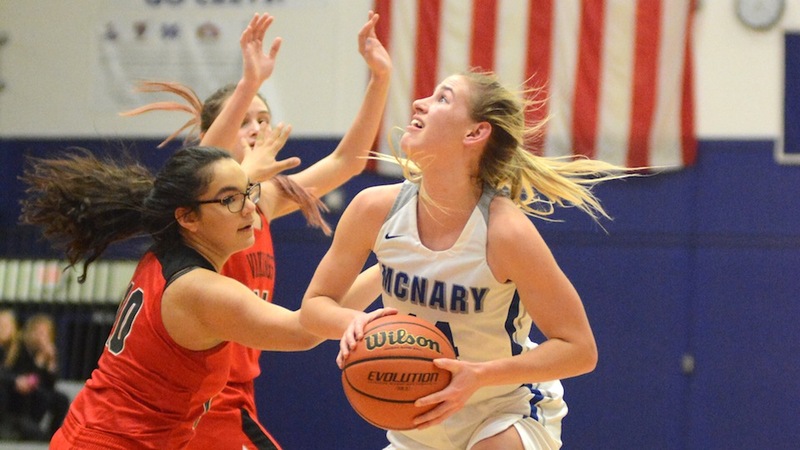 McNary hosts Sprague on Friday, Jan. 26 beginning with the girls game at 5:45 p.m. The Sprague boys are 14-2 overall, 9-0 in league play and No. 1 in the OSAA power rankings. The Celtics are ranked fifth. The Olympians defeated McNary at Sprague 70-62 on Dec. 15.